Living your best life begins when you tap into your unique talents. And it starts by completing one online assessment. In return, you’ll receive insights that will change the way you work and will impact the rest of your life. 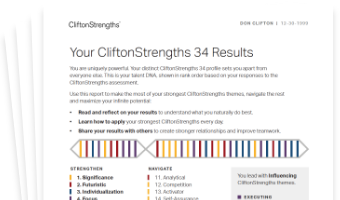 Discover what makes you exceptional and maximize your potential by taking the CliftonStrengths assessment today. Gallup's CliftonStrengths online assessment measures your specific order of 34 themes of talent. Those themes are your talent DNA. The odds that someone has your same order of 34 CliftonStrengths themes are roughly 1 in 259,000,000,000,000,000,000,000,000,000,000,000,000. The CliftonStrengths assessment uncovers which talents you rely on to build relationships, think strategically, execute plans and influence others to accomplish goals. When you know your unique set of these talents, you're empowered to succeed by doing what you naturally do best. Every. Single. Day. People who get to use their strengths at work are 6x more likely to be engaged. What would make you better at work? Working with people who don't understand you. Doing a job that doesn't fit. Answering to someone who focuses on what you aren't rather than what you are. Or, a different option: Teammates who get you. Being in the right role. Getting career development from someone who knows what you do best and puts you in a position to do that every single day. So, how do you build better relationships at work? Find the right role to fit your talents? Have powerful, constructive conversations with your manager? Start with the CliftonStrengths assessment. It all adds up to being 3x as likely to report having an excellent quality of life. The power of CliftonStrengths doesn’t stop when you leave the office. Discovering your 34 CliftonStrengths themes of talent does more than set you up for better performance at work. Plus, people who use their CliftonStrengths are less likely to experience deterrents to their well-being, like worry, stress, anger, sadness or physical pain. There’s no real secret to living your best life. All you need is a willingness to discover your unique talents. Use them every day. Apply them in your relationships at work and everywhere else. You can start today by completing the CliftonStrengths online talent assessment. CliftonStrengths is more than an assessment. Discovering your CliftonStrengths is just the start. You can transform your team and your organization using Gallup's CliftonStrengths solutions. 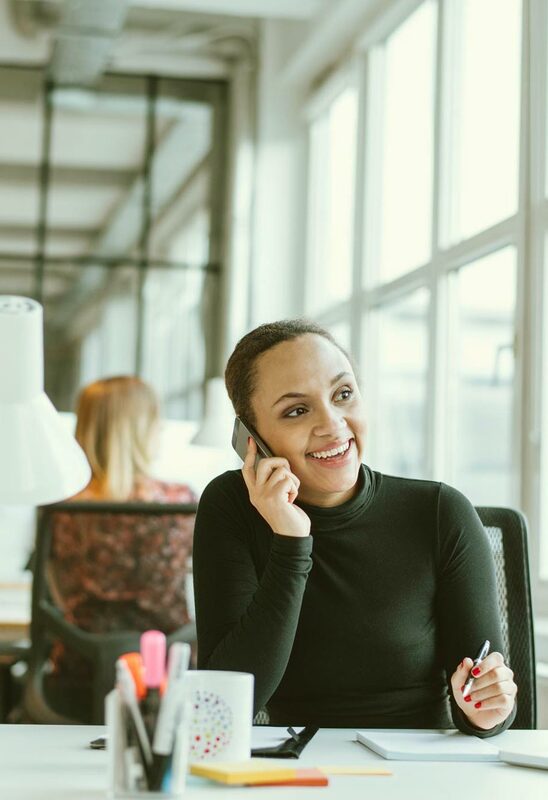 Whether you want to find a coach to help you get the most out of your talents and others' talents, or you want to become a coach, we can help.